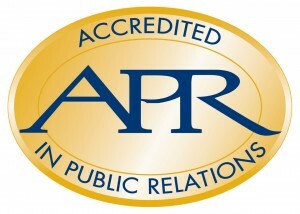 Accredited in Public Relations (APR) is a mark of distinction for public relations professionals who demonstrate their commitment to the profession and to its ethical practice, and who are selected based on broad knowledge, strategic perspective, and sound professional judgment. You can contact Edith Parten APR, Vice President for Professional Development and Accreditation for the PRCA West Alabama Chapter, if you’re interested in taking the steps toward accreditation. ​Check out some of the testimonials from those who have already earned their APR. Click the video above, and watch more here from the Universal Accreditation Board. Nancy Randall, right, receives her Accreditation pin from Cathy Butler, APR.